I’ve been worried lately about not updating this website enough. I’ve been worried we’re losing our memories. When I was back in Philadelphia I would update my personal journal nearly every day, everything from the mundane to the humorous to the heartbreaking was recorded in my journal, and it has captured many of my thoughts for the past 2 years. But updating this website is a bit trickier then simply sitting at your work computer and pounding out a quick journal entry before the start of the day. To update our website, there’s the odd phenomenon known as the internet café which we must navigate through before posting successfully. Virtually unavailable in the States, it seems the internet café is as common as Starbucks in Argentina, all with various degrees of equipment (many with keyboards that will stick on random lettttttters as you typeeee), varying speed (including the v e r y s l o w d i a l – u p), and about 20 middle school kids hanging out and playing online games rather enthusiastically. It is not exactly the best place to be inspired. Of course, there’s also the question of experiencing the trip and recording it. We don’t want to be so focused on recording everything that we forget to live everything. But we also don’t want to be so focused on experiencing everything that we forget to record what we’ve lived. There’s a balance that should be had, we know that. But the question is how much weight do we add to each side? I have a little spiral ring notebook that I carry with me in my day bag. It’s only 3x5 and its main purpose is to record what money Tim and I spend each day. But it is quickly becoming the most valuable thing that Tim and I own, not for the numbers it records, but for the memories. Now, if we removed the Lonely Planet books (which were just painful to purchase in Buenos Aires as the prices for books are more expensive there), it was a fairly typical spending day at 53.15 pesos or $17.70 USD. (Actually, that’s a bit higher than many days.) Add in our lodging at 64 pesos or $21.30 USD, and we spent only $39 the entire day for two people. 27.40 pesos – Groceries (2 tomatoes, onion, red pepper, sauce, pasta, cooked chicken, 1 bottle of wine, cheese, 2 spices)…cooked our Buenos Aires pasta in kitchen, talked to sweet Irish couple for long time, ate dinner while watching TV with Chris and Vikki, shared some whiskey with Chris before bed. You see, after reading that page, after reading just those few little notes, I am completely transported to that day. I remember sitting in the bakery, sun shining through the window, and relishing the media lunas (croissants), while watching everyone come in and out, the owner’s sunny voice greeting everyone in turn. I remember how the bookstore owner’s face looked when she told us this is the best time in our life to do this trip. And I remember her eyes when she seemed to imagine herself in Italy, her voice becoming wistful, and it looked as if she were actually there. I remember walking 2 miles just to find our kitty park, our nickname for a lovely nearby park, and passing a fresh fruit stand on the way and absolutely needing to buy bananas. I remember sitting in the shade when we ate our empanadas (and discovering entire olives inside rather then the usual pieces) and moving to the sun when we read. I remember watching the dogs race around us, playing tag, and the little girl who asked us for the time. And I remember cooking in the kitchen of the hostel, thoroughly enjoying talking to Colin and Aoife as they sat at the nearby table, smiling to myself and thinking this was exactly what I wanted when I dreamt of the trip. And finally I remember watching the end of Top Gun with Chris and Vikki, while Tim and I savored our meal, and laughing to myself about how perfectly natural it seemed to be in a youth hostel in Buenos Aires and watching Top Gun with Spanish subtitles. I’ve been sitting in our cabana, making notes to myself for my next website update (and to be perfectly honest, feeling a bit overwhelmed by the amount of material we have to catch up on), all the while flipping through the CDs we’ve burned to our Sony Minidisc in search of something new to listen to. I was listening to a bit of U2’s The Joshua Tree, but had an urge to listen to Enya’s A Day Without Rain (there’s certainly something about being surrounded by nature that makes Enya even better than usual), and so I looked down at the Minidisc to see where I was in the U2 album. The song’s title that scrolled past the screen was for track 11, the last song on the album. And although it’s a song I’ve always enjoyed (there are few U2 songs I do not enjoy), I had never known its name: The Mothers of the Disappeared. I looked twice at the title, not fully believing what it was I saw, and confirmed that I read it correctly, The Mothers of the Disappeared. And in that instant I was transported back to a beautiful, sunny day in Buenos Aires. Tim and I were in the Plaza de Mayo, the plaza we had fed the birds in just the week before. It was Thursday at 3:15pm and a small crowd of listeners had gathered around an elderly woman speaking in broken English with an Argentinean accent. She had the face of a grandmother, warm and wise, and her eyes seemed to hold the knowledge of things that one should not know. She was dressed modestly, in a long skirt and a bright red sweater, with a white handkerchief holding her hair back. The handkerchief had hand sewn words on it. And the words identified her as one of the Mothers of the Disappeared. Argentina’s government during the years of the Dirty War, she explained, had taken away 30,000 of its citizen. During the night or during the day, from their homes or their places of work, people who spoke out against the government and people who had opinions began to, simply, disappear. To this day their whereabouts is unknown. And to this day, the government fails to fully acknowledge their role in their own people’s disappearance. 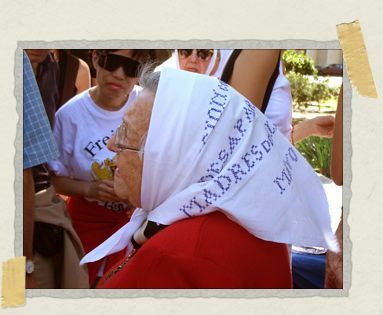 And so the elderly woman spoke to the crowd, and she explained that every Thursday at 3:30pm the remaining Mothers of the Disappeared marched in the Plaza de Mayo in front of the palace belonging to the President of Argentina. To remember, she said, and to remind those who would listen of the past. Save for this account, Tim and I haven’t written about that experience yet. 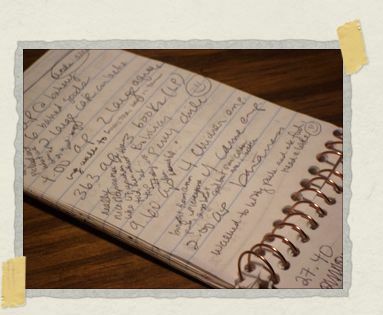 And in my little notebook, it only says “walked to las madres.” But I get goose bumps every time I remember that day. And I remember that day because it was one of the most moving things I’ve ever experienced, to listen to a Mother of the Disappeared, to see the women I read about in high school marching silently, to pay them respect and to acknowledge that people do remember, that people can remember. And so I sit here now, looking out the front window of our cabana at the foothills of the Andes with Enya finally playing in the background, and I know there are many memories that won’t be captured on our website. I know there are many experiences that won’t be written down in my small notebook. But now I also know that it can and will be something as simple as a song title that will bring me back to any moment in time. This is a trip of a lifetime and these days are creating memories for life. And as long as I am living them each day, savoring every moment – whether it be snoozing in the early morning while cuddled next to Tim in our cabana or feeling the waves of the ocean wash over my toes along the coast of Uruguay – as long as I am living, there will be a piece of me which will remember. so much love to you, jess. May you always remeber with joy the experiences you had while on this trip. May your heart dance each time it remembers a particular sight, sound, or smell. May you and Tim walk in the eternal sunshine of a blessed life. really enjoyed this entry – the whole idea of maintaining a balance between experience and journalling. the amazing bus-sub was pretty darn cool in the previous entry as well. sounds like one of those surreal dreams you get after eating krispykremes for dinner the night before. I love the notebook. I have a similar one when I travel and it is amazing to me how the little details will really take you completely back! Keep at it. The trip really has only just begun and you've already experienced such amazing things! I so happy for you two! Some advice: spend a few extra pesos and get copies of your notbook every so often. Send it to your daddy or sister soldier for safe keeping. Look out philsie, I'll be back…meow to you. brought tears to my eyes. save that notebook…its incredibly valuable. When this trip is over ( and my "vibes" tell me it's going to last longer than you think <wink> you have all the material you need for (several) bestsellers! We're still traveling and I am now sitting in the common room or a home-like B&B in the Marigny neighborhood of New Orleans. I am having the same debate about cherishing the moment and recording it for prosperity. Always a hard call. I've found that the feelings stay but the specifics of the memories fade. Not sure if that's a bad thing. This is pretty much the attitude I have 5 years ago. However, I now wish I had kept better records…specifically that I have taken more pictures (and that more of the ones we did take weren't lost in the mail…rrr). It seems to me that you guys have found a good balance. Your records will not only serve you well, but they are allowing all us readers to vicariously experience such amazing things.